Cook and drain sugar snap peas as directed on box. Cool 1 minute. 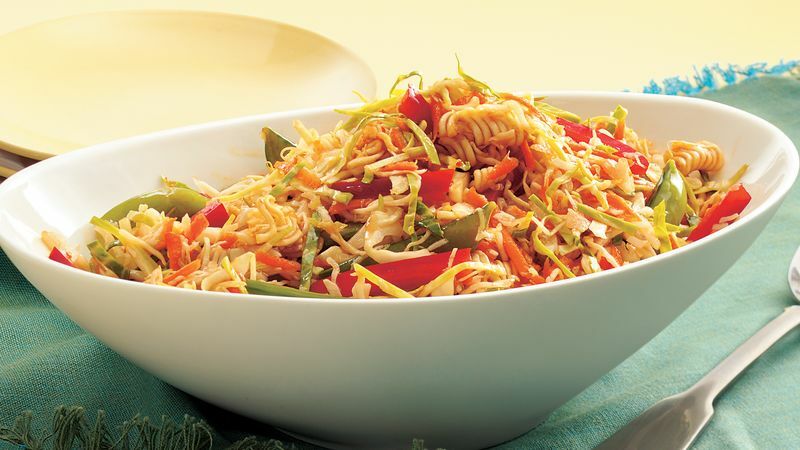 Meanwhile, in large serving bowl, toss coleslaw mix, bell pepper and carrots. Discard seasoning packet from soup mix; break noodles into bite-size pieces and add to salad. Add sugar snap peas to salad. In small bowl, mix sweet-and-sour sauce and soy sauce; pour over salad and toss gently. Cover; refrigerate at least 1 hour to soften noodles before serving. If the sweet-and-sour sauce that you are using is not sweet enough for your taste, go ahead and add 1 to 2 teaspoons honey to the dressing mixture.